QantasLink is to upgrade the interiors of five Boeing 717 rear-engined twin jet aircraft to include Business Class and in-flight entertainment for all passengers. The last British-registered Lockheed Electra L188 (G-LOFC, aged 54 years) has departed from Coventry Airport to a new life flying for Buffalo Airlines in Canada. Now owned by Electra, the major private equity investment firm, (See BTN 13 May) OAG, the aviation data specialist, has launched OAG Connections Analyser, an innovative tool that generates accurate flight connections information based on real-time data. 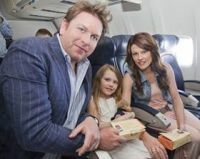 Charter airlines might not count as business travel operators but business travellers certainly use them, if only for their own family holiday. Norwegian has signed a Memorandum of Understanding (MoU) with Virgin Atlantic allowing the hitherto low-cost airline to tap into Virgin Atlantic’s expertise on long haul operations, while Virgin Atlantic’s instructors will receive pilot training on board Norwegian’s brand new 787-8 Dreamliners. 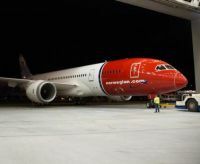 Norwegian’s first Dreamliner is due for delivery at the end of June. 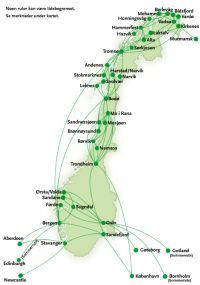 SAS Group, in another cost cutting move, says it plans to sell 80% of its Wideroe regional airline to Norwegian interests. The Bombardier Dash 8 operator has been on the market since last year. 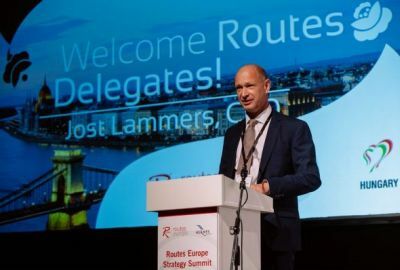 The change of ownership will not change any commercial arrangements between the two airlines and could result at some point in the future of a total takeover. Get your BTN by email Sunday night – Monday morning. Don't pass it on. Ask your friends / colleagues to subscribe for free. BTNews is committed to protecting and respecting privacy. Email addresses will not be passed on to a third party and are only ever used for the weekly distribution. Thomson Airways, whose £5m promotion campaign for the Boeing 787 had to be embarrassingly withdrawn early in the New Year, is finally expected to receive its first Dreamliner at Manchester on Friday 31 May. The 291-seat 787-8 will fly in direct from Everett, Seattle, with Managing Director Chris Browne on board. Star Alliance member Aegean Airlines is to introduce a Saturday and Monday service between Manchester and Athens on 25 May. It will compete with an existing easyJet operation that flies on Wednesday, Friday and Sunday. With airlines, for the most part, selling tickets per single flight this means that Manchester will now be connected to the Greek capital with non-stop services every day except Tuesday. 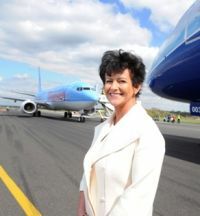 Monday 13 May was an important day for rapidly expanding bmi regional, once Aberdeen-based but now with East Midlands Airport as the centre of its operations. As its name implies it is truly regional and operates 18 Embraer jets with a one class set-up cabin. All flights include complimentary food and drink on-board, free 20kg hold baggage allowance and 30-minute check-in. 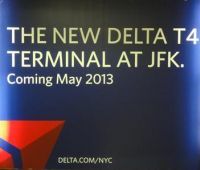 Kennedy Airport New York will later this week see the official opening of Delta Air Lines new main home in Terminal 4. Sadly this means the demolishing of its former quarters at the futuristic old Pan Am Terminal 3. For the future all international services will use the brand new US$1.4bn facility whilst domestic flights, and that includes Honolulu, are housed in Terminal 2. A major feature will be an open air rooftop executive lounge, a first for the airport in the modern era. Last week was mixed in term of financial results for easyJet and Virgin Atlantic. Both announced losses but for the Luton-based carrier they were positive in that they were less than the same period last year with a fine 12-month forecast. Virgin, under new management, stated that things were bad but forecasted good times in 2015. 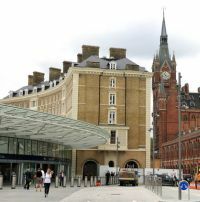 The Great Northern Hotel, sited at the crossover between King’s Cross and St Pancras stations, has had a ‘soft’ opening, following a comprehensive £40m rebuilding programme. Rooms are currently available from £160. 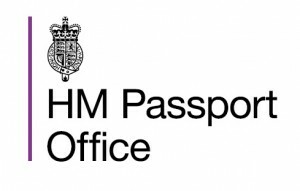 A new name has been given to the agency which produces all UK passports – Her Majesty’s Passport Office. Formerly the Identity and Passport Service, the new name is designed to make the service more easily recognisable to British citizens at home and abroad. It marks a watershed moment in the agency’s departure from its association with the National Identity Service and ID cards. 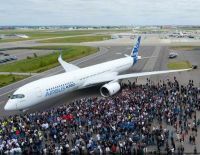 Painting of the first A350 XWB ‘MSN001’ has been fully completed and shown to staff at the Airbus plant at Toulouse. The aircraft painting was achieved in less than seven days and follows the recent completion of MSN001’s flight-test-instrumentation (FTI) verification. Last month the aircraft underwent its engines' installation, and passed a subsequent intensive phase of ground vibration tests. MSN001 will soon start the final tests before its maiden flight this summer. 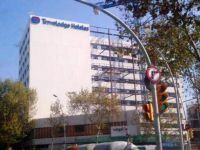 Travelodge strengthens its presence in Spain by opening its biggest property in the country’s second largest city, Barcelona. The new purpose-built 250-room hotel which is situated in the heart of the most innovative district in Barcelona called 22@ – also known as the city’s ‘Silicon Valley’ representing an investment of €30m. 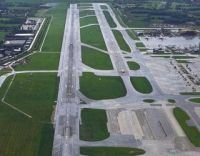 Another week of Airport Commission lobbying and news saw Sir Howard Davies' panel suggest that analysis by the CAA pointed to Gatwick as a second hub. 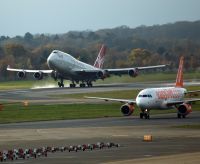 In a comprehensive 58-page document published last Thursday 16 May Davies concluded that it might be possible for one of the three global airline alliances at Heathrow to move to another airport without any large scale damage to their operations. and will be initially provided at 27 key airports amounting to 54% of the airline’s network. 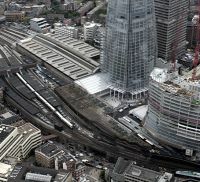 Southern’s summer 2013 timetable came into effect on Sunday 19 May and because of changes to platform availability at London Bridge, passengers are being advised to check train times carefully before travelling. 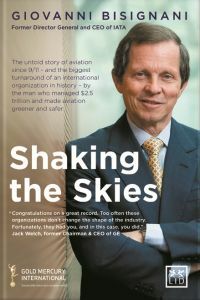 Today (20 May) sees the launch of former IATA Director General and CEO Giovanni Bisignani’s semi autobiographical book Shaking the Skies. It is bound to be controversial. 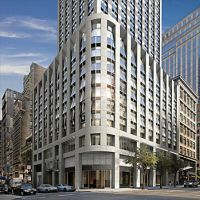 Langham Place, Fifth Avenue has joined the New York City luxury hotel landscape with Langham Hospitality taking over the management of The Setai Fifth Avenue.